Breakthrough Publications. Very Good. 1988. First Edition. Softcover. 0914327224 . Ex-library book, but still in quite good condition - sturdy laminated cover and usual ex-lib type of markings. Pages are clean and intact, light soiling/spotting to outer edge of pages. B/w illustrations. 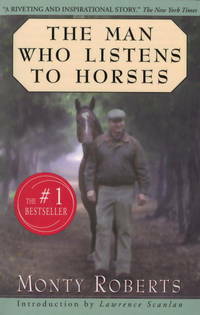 Complete, Authoritative Information on the Purchase and Use of Equestrian Equipment of all Kinds. (945,0811) ; 4to 11" - 13" tall; 319 pages . Storey Publishing, LLC. Very Good+. 1997. First Edition. Softcover. 0882669567 . Excellent condition, clean and unmarked. Cover has light corner wear, light scuffing & a couple light scratches. B/w photos. 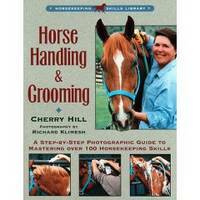 ; 4to 11" - 13" tall; 160 pages; Award-winning horse handler Cherry Hill provides a user-friendly guide to the essential skills of horse handling. She includes feeding, haltering, tying, grooming, clipping, bathing, braiding, and blanketing. The wealth of practical advice offered is thorough enough for beginners, yet useful for experienced riders improving or expanding their skills. Includes charts and glossary.  .
AB: Lone Pine Publishing. Very Good. 1989. First Edition; Second Printing. Softcover. 0919433626 . Ex-library book with sturdy laminated cover & usual type markings. Light edgewear & scuffing to laminate, light soiling outer edge of pages. Internal pages clean & tight. Covers care & feeding, horse psychology, pasture management, etc. 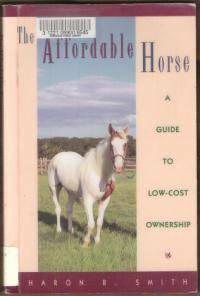 A complete guide to small-scale ownership & care of horses. ; 4to 11" - 13" tall . Howell Book House. Very Good. 1994. First Edition; Fourth Printing. Softcover. 0876059663 . Ex-library book, but still in quite good condition - sturdy laminated cover and usual ex-lib type markings. Light edge and corner wear to cover, light soiling/spotting outer edge of pages. Pages are clean and intact. B/w photos. 184 pages. ; 8vo 8" - 9" tall; "This book is full of practical suggestions for finding an affordable (or free! ) horse and providing care and living arrangements at an affordable cost. There are many alternatives available for those who are willing to ask questions, make telephone calls, and do a little leg work. 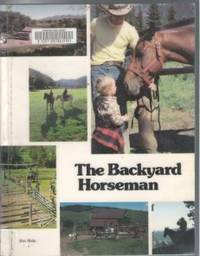 The author, an experienced horsewoman and owner, discusses purchase of the horse, feed, healthcare, living quarters, equipment, and insurance...." [400? -os] . Vintage Canada. Near Fine. 1998. First Edition. Softcover. 0676971288 . Excellent, near new condition, clean & tight, one crease on back cover. B/w photos. "Monty Roberts is a real-life horse whisperer--an American original whose gentle training methods reveal the depth of communication possible between man and animal. " (*shipping will be reduced to most locations) ; 8vo 8" - 9" tall . Fireside Books. Very Good. 1998. Softcover. 0684852152 . Light wear to edges & corners, light soiling, a little corner curling. Interior pages clean & unmarked. Great illustrations by the author. Foryou to enjoy me (and for me to enjoy you, too) there are some important facts about me which you should know before you try to handle or ride me. "I am a Horse. "My name in Latin is Equus. From this name comes the word 'equine' which means something to do with a horse, and the word 'equestrian, ' which means one who rides a horse. 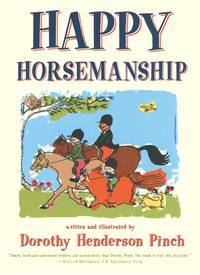 "With this, Happy Horsemanship starts you and your child on a most wonderful journey. Told from the point of view of the horse, this little gem introduces every aspect of riding and caring for horses -- from body to mind, from tack to riding position. " (*shipping will be reduced to all locations) ; 8vo; 182 pages . By Hope, Lt. Col. C. E. G.
London: Pelham Books. Fine in Very Good dust jacket. 1969. First Edition. Hardcover. 0720701953 . Hardcover is clean & unmarked, a little bumping to spine ends. Jacket has light edgewear, small tear to rear, age tanning to edges, small rub on front and light rubbing of edges, light soiling, not price clipped. 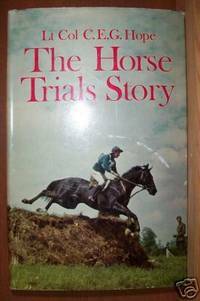 b/w photos.Horse trials or Three-Day-Events had their origin in the cavalries of Europe, hence the original title for them of "The Military". The fascinating history of this event is told in this profusely illustrated book, including full records of all the leading events. Frontis photos of Lt. Charles Pahud de Mortanges of Holland who made a still unbroken olympic record by winning the individual 3-day event gold medal twice in succession, in 1928 at Amsterdam and 1932 at Los Angeles. ; 8vo - over 7¾" - 9¾" tall .